Ask yourself why the items are being thrown out. This takes a certain amount of intuition. People with bedbugs tend to throw out mattresses, rugs, furniture, decorations and fabrics. People with bedbug infestations don’t tend to clean out their pantry or freezer, so if you see that kind of food-related stuff in the pile the other items were likely tossed for some other reason. Still, the presence of a mattress doesn’t necessarily mean bedbugs are present, and I once found nearly 50 cans of food at a heavily infested spot, so it’s important to be vigilant no matter your intuitions. 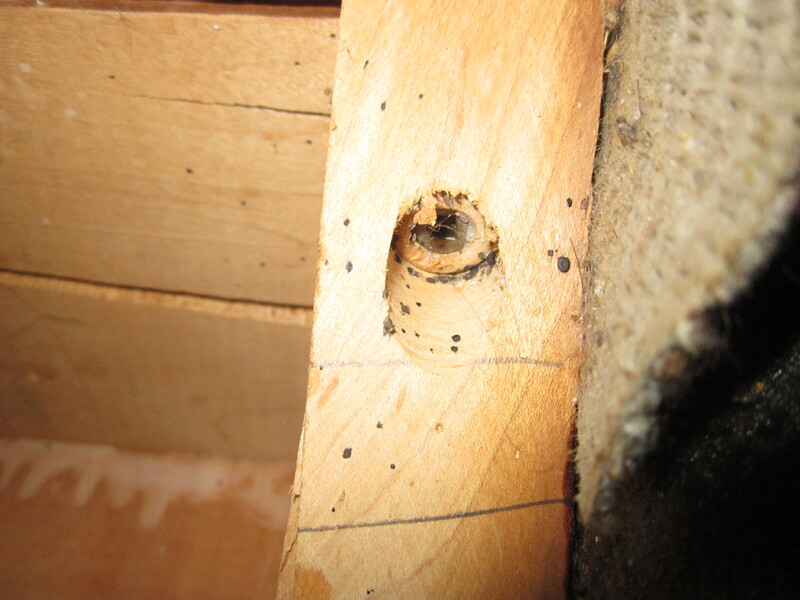 Inspect what you take / know the visible signs of a bedbug infestation. You’ll likely see black spots (poo – above) long before you see an actual bug. Thankfully, the bedbug poo pattern is pretty distinct and you won’t need to see a bug, cast skin, or eggs to identify the problem. You will typically find the poo around the bugs’ favourite hangout spots, including but not exclusive to: seams on mattresses, screw-holes, and cracks in wooden furniture. Basically, they hide and poo where you’re not likely to see them on a day-to-day basis. 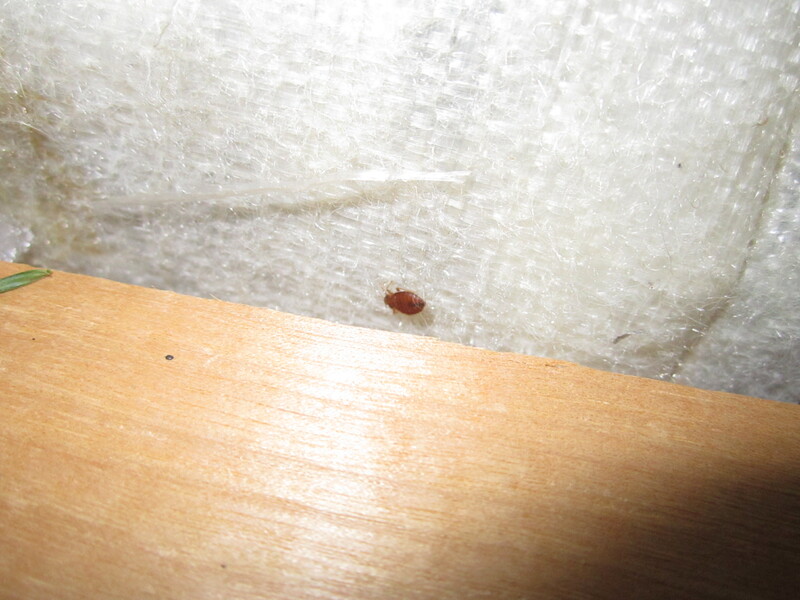 Bedbugs also like to have easy access to your blood; they rarely live more than a few meters from their food source. This makes bedroom furniture, such as bed frames and dressers a particularly risky take. If you’re brave / not particularly squeamish – relatively fresh bedbug poo will often smear if dampened, especially the stuff on hard surfaces. If the pile you’re interested in includes a mattress, box spring or wooden bed frame inspect those items even if you don’t plan on taking them. Bedroom furniture is a great source of information – if they were thrown out due to infestation there will be evidence (poo), but if they’re clean the other stuff likely will be as well. Be especially cautious with apartment building garbage. Bedbugs can easily spread between units, and all it takes is one oblivious person or a bad landlord to cause a huge issue. Make a habit of being cautious with clothes and other fabrics. Unless you’re certain about them being bedbug-free, I would throw them in a dryer (without washing them first) just to be safe. Bed bugs can’t stand the heat and will die after even just 10 minutes of drying, though I’d probably leave them in there longer just to be safe. Apparently washing clothes will likely kill them as well, but I still feel more confident in the heat method. If you spot bugs on otherwise nice looking trash take a bit of time and somehow mark or ruin the items. If I have a sharpie or pen I’ll write “bedbugs” (or “punaises,” in the more French parts of Montreal) on furniture and the like. Otherwise, I might cut the fabric with a key or knife so that the furniture is no longer desirable. I honestly think that bedbugs are spread in large part by people taking infested furniture from the curb, so it’s best to save the folks who don’t know any better from themselves when possible. Put your things in the dryer for 30 minutes BEFORE putting them in the washer. The eggs are not killed by the washer, so you would just be spreading them in your washing machine where they will hatch later. I agree, especially if things are already clean anyways. It’s the heat that kills them for sure. Why would you even take the chance. Ridiculous in a bed bug infested city? It’s not really much of a risk once you know what to look for. Since a rookie mistake back in the day I’ve never gotten bedbugs despite trash picking pretty much all the time. I am really glad that someone is doing this. It’s a shame what kind of things go in the trash, especially considering that old things tend to be of higher quality.